Thanks Tiffany for sharing an awesome find!! Shopkick Is excited to help you find great deals and products at your favorite stores. Get free rewards just for visiting stores like Target, Old Navy, and Best Buy. Invite your friends to get started. They’ll get 50 kicks toward their first reward. Shopkick is the shopping app that rewards you with FREE gift cards for the shopping you already do, while you still save on your budget money! Join the millions of Shopkickers who have earned over $63.8 million in points that they use to redeem free gift cards to shop at Starbucks, Walmart, Sephora, and more. Kicks When You BuyOur Kicks When You Buy program, also referred to as kicks for purchase, or kicks for purchase with linked card, or Buy & Collect, lets you associate one or more of your credit or debit cards issued from certain card networks, stores or card issuers (each, a “Card”) with your Account using the Application, so you can be eligible to receive kicks when you use that Card at a participating merchant for certain qualifying purchases (“Card Awards”). If you choose to associate a Card with your Account, we will direct you to a secure site operated by the Card network or issuer on shopkick’s behalf where you will be required provide your Card information and agree, that certain transaction information from your associated Card can be shared with shopkick as well as other Card network or issuer-specific terms and conditions, as applicable. We will use the information provided by a Card network or issuer solely to enable your participation in Kicks When You Buy by enabling redemption of offers from participating merchants, sharing return information with participating merchants to enable shopkick to validate offer eligibility, award kicks and provide aggregated and anonymized reporting to the applicable participating merchants, and for no other purpose. shopkick and each Card network or issuer will not be responsible for any errors or mistakes associated with that secure site and shopkick will not store your Card number. The Card network or issuer will register your Card on shopkick’s behalf and will provide a non-Card number identifier with shopkick that relates to your associated Card. Card networks and issuers’ only role in Kicks When You Buy is to provide data from your associated Card to enable your participation in Kicks When You Buy. Once you have associated a Card with Kicks When You Buy, you may remove the association at any time through the Application, however the Card Network or issuer may still continue to deliver shopkick information about your returns at participating merchants for a limited period of time after the association has been removed to use solely for the above purposes. You may only associate a Card with your Account if you are a registered user of the Application who also has a verified phone number associated with your Account. Card Awards may not be used until a certain time period (for example, for returns associated with that participating merchant) has expired. Typically this is between 30 and 45 days, but it could be longer, as indicated in the Pending Purchase section of the Application. If you make a return, the transaction is invalidated, disputed, or does not settle for any reason, then some or all pending kicks will be decremented from your Account, as determined and at the sole discretion of shopkick. If you make a return for cash, store credit or credit to a different credit card, we will still need to take away some or all of your pending kicks accordingly. We, the Card networks and issuers are not in any way liable for your use of the Card at a participating merchant, any issues you might have with the participating merchant or the Card issuer, or any returns or attempted returns at the participating merchant. Unfortunately we, the Card networks and issuers cannot be liable for any errors or omissions in awarding the kicks for a number of reasons, including because we cannot control the accuracy of the information we may receive from a participating merchant. Our Kicks When You Scan program lets you earn kicks by using the Application’s scanning function to scan participating products’ bar codes with your mobile or other device. Shopkick from time to time announces to you the identity of participating products, as well as locations where those products might be available, via messages distributed through the Application. shopkick does not guarantee that advertised products will always be available for scanning at published locations (e.g. a vendor may pull products from its shelves, a product may be out of stock, etc. ), or that bar codes will always be accurate, and thus shopkick disclaims all responsibility for any failed scanning experiences or errors or mistakes occurring during a scanning attempt. Additionally, we cannot be liable for a failure to award kicks, including due to the inaccuracy of the information we may receive from participating product manufacturers or because of a limited kicks allocation having previously been fully distributed to other Account holders. 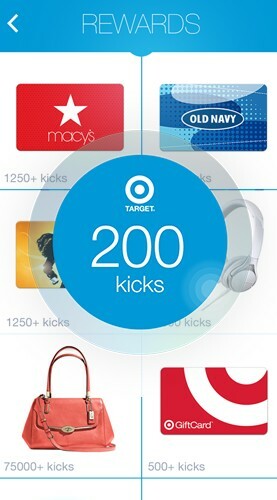 By participating in the Our Kicks When You Scan program, you agree that shopkick is under no obligation to notify you when an allocation of kicks for distribution under this program has reached a zero balance for any given product, and kicks will be distributed on a “first come, first served” basis. NO Land Line Required for this one!!! Join Nielsen Home Scan Consumer Panel.